Capture Yellowjacket in the flying ants pincers! Get set for a massive battle on a micro scale! 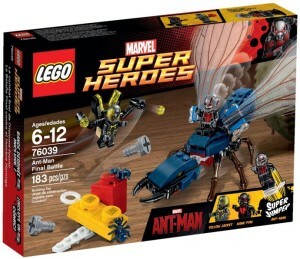 Ride with Ant-Man on the giant flying ant, firing the flick missiles on each wing. Evade Yellowjackets stud shooters and LEGO brick-built catapult. After landing, use Ant-Mans special powers to communicate with the ants and activate the Super Jumper to knock over Yellowjacket. Take off again on the flying ant and swoop to capture Yellowjacket in its pincers! Includes 3 minifigures with weapon and accessory elements: Ant-Man, Hank Pym and Yellowjacket.